Tri-Mountain Realtree/Mossy Oak 8886C Mountaineer Camo [8886C Camo] - $52.99 : Sogowear Outfitters!, Polo Shirts, Golf Shirts, Jackets, Fashion Fleece, Woven Shirts and More! 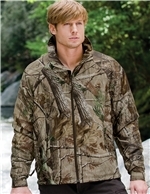 Designed for the hunt, this three-season jacket features the popular Realtree AP™ pattern. Constructed with a shell of windproof/water resistant polyester micro twill and is lined with heavyweight 11.2 oz. anti-pilling Panda Fleece™. Features include two front zippered pockets, inner zippered pocket and the EmbAccess system for clean embroidery. Adjustable cuffs and an open bottom with draw-cord hem for a custom fit.